Objective : Study about light and what happens when it gets bend. Refraction is the change in direction of a wave due to a change in its speed. This is most commonly observed when a wave passes from one medium to another at any angle other than 90° or 0°. Fish tank filled with sugar water solution (5 parts water, 1 part corn syrup) and left to settle over the weekend results in an index of refraction that varies with depth (greater at the bottom of the tank). 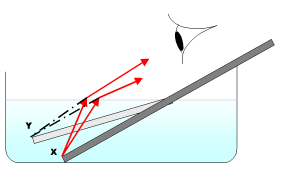 Because of the variation in the index of refraction, light bends instead of traveling in a straight line. Snell’s Law : is a formula used to describe the relationship between the angles of incidence and refraction, when referring to light or other waves passing through a boundary between two different isotropic media, such as water and glass. Electromagnetic Radiations : is a formula used to describe the relationship between the angles of incidence and refraction, when referring to light or other waves passing through a boundary between two different isotropic media, such as water and glass. Sun is 150 million km ‘s away from earth. Can you imagine , with the speed of light , it takes only 8 minute 19 seconds to reach from sun to earth.You can measure speed of light yourself with the help of microwave. In the video given below , it has shown that how we can measure the speed of light with the help of wave formations on chocolate . Absolute permittivity is the measure of the resistance that is encountered when forming an electric field in a medium. In other words, permittivity is a measure of how an electric field affects, and is affected by, a dielectric medium. The permittivity of a medium describes how much electric field (more correctly, flux) is ‘generated’ per unit charge. 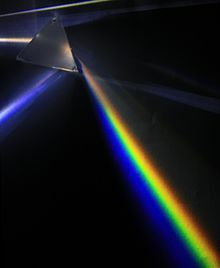 Optics is the branch of physics which involves the behavior and properties of light, including its interactions with matter and the construction of instruments that use or detect it.Optics usually describes the behavior of visible, ultraviolet, and infrared light. 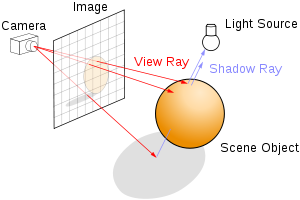 Ray Tracing: In computer graphics, ray tracing is a technique for generating an image by tracing the path of light through pixels in an image plane and simulating the effects of its encounters with virtual objects. Fermat’s Principle : Fermat’s principle or the principle of least time is the principle that the path taken between two points by a ray of light is the path that can be traversed in the least time. This principle is sometimes taken as the definition of a ray of light.